The Bottom Line: An intelligent, textured and taut thriller about political corruption through the lens of a disgraced journalist. Levi Cole had enjoyed a remarkable career as a journalist, rising from a small-town sportswriter to regular cable news contributor and charming political pundit. But he owed much of his success to an anonymous source that led to his veritable takedown of the governor of Texas. Two years later, the same source exposed him for fabricating some of his work. As his employer prepares to publish retractions on his past stories, Levi retreats to his hometown to hide from whomever has decided to ruin his life. While at home, he sets about seducing Kat Hallaway, a married fellow reporter he had an affair with years earlier, by assisting her with a story about a murdered high school girl. While Kat isn’t exactly happy to see him, she could use the help. She’s in danger of losing her job unless her stories generate more web traffic. During the investigation, Kat herself becomes a target of the killer, forcing Levi to choose how far he’ll go to save the woman he loves. 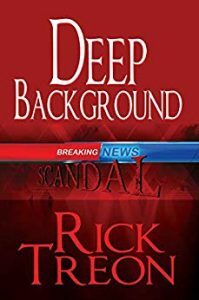 First-time novelist Rick Treon hits a home run for his depiction of the delicate and often messy relationships between reporters and politicians, editors and journalists, and co-workers who toil together for long hours. Bonus points for shedding insight into the economic realities of journalism and the resulting sensationalistic effect on news.